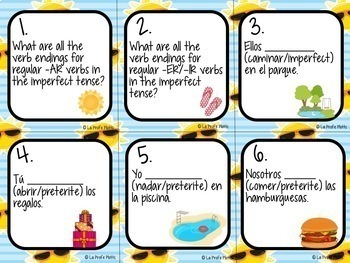 Want to review everything your students learned in Spanish 2 before they leave for the summer OR go over Spanish 2 concepts at the beginning of Spanish 3 to refresh your students' memories? 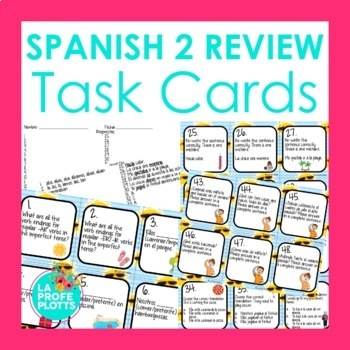 This task card set comes with 48 different cards to get your students up and moving while reviewing topics learned in Spanish 2. 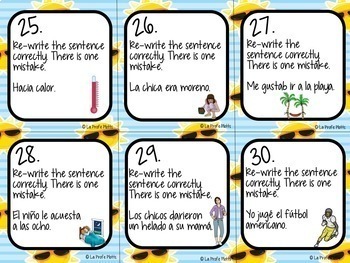 Students will be engaged as they complete various tasks on the included response sheet like conjugating regular and irregular preterite and imperfect verbs, as well as reflexive verbs, filling in the blank with the correct form of the verb in parentheses, writing sentences from prompts given, answering multiple choice translation questions, re-writing sentences with an indirect or direct object pronoun, identifying rooms of the house and household items from pictures given, and fixing the grammatically-incorrect sentences. Task cards can be used in many different ways! 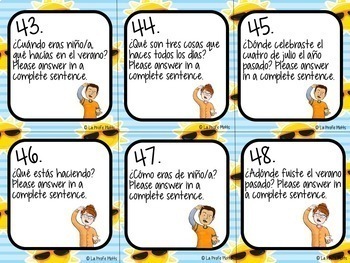 There are also *Spanish 1 Review Task Cards* available! Click the link to see them! Looking for other activities to review these topics? These task cards pair really well with my super fun Spanish 2 Review Jeopardy-style Trivia Game! You can also check out the Spanish Reflexive Verbs Jeopardy-Style Trivia Game, Irregular Preterite Tense Verbs Jeopardy-Style Trivia Game, Preterite vs. Imperfect Jeopardy-Style Trivia Game, Imperfect Tense (Regular and Irregular) ¡Cucharas! Game, and 48 Using Present Progressive With Chores Task Cards!